Although this was originally a Shaker hymn, we heard this beautiful piece (which we know from our Music Together classes) played in Amish country during a museum tour of Amish and Mennonite history. Last week (July 2-July 8) I found myself in the place just right. Shipshewana, Indiana: the land of my ancestors on my mom’s Yoder side. Never have I found myself in a place—in all of my life—where my values and preferences and personality make so much sense. Living on this land, meeting some of the Amish, and spending time with my extended family for the Reuben Yoder Centennial Reunion, I felt so much at home. We all did. Katie (and she’s not the only one, by far) has been making plans for us to move there permanently, and I have no doubt at all that this will likely be in my future at some point. Traveling there felt like going home, to a home I had never seen, but a home that felt as if I had been there loving that land and those people my whole life. Although I am a 5th generation Californian, the way and pace of life there in Shipshe is in my blood. I think of all the family I met there—who opened their arms to us as if we were long lost out here in California and were so happy to see us and know us. Hard working farmers, kind Mennonites, a whole array of cousins and elderly kinsfolk with stories worth hearing and passing onward, they are on my mind today. My mom was a Yoder before marrying my dad. Her grandfather, the “adventurer” as our people call him, came out to California from Indiana. My grandpa was born here but would travel back often with my Great-Grandpa Ervin Sr. to see family. The Reuben Yoder descendants, for our side, go like this: Reuben Yoder–>Moses Yoder–>Ervin Yoder Sr.–>Ervin Yoder Jr.–>my mom Rebecca Yoder–>Me–>Katie/Eric. Reuben Yoder had nine children, though one died and one never had children. At the reunion, we were considered part of the Moses Yoder line, and even had a breakout “mini-reunion” with the Moses Yoder people. Moses Yoder had several children as well, sisters and brothers of Ervin Sr. Thank goodness, there is a book to keep all the lineage straight! My husband and children are in the book, as well. Chris Yoder, the reunion organizer and part of the Samuel Yoder family, is an expert in our family history and lore and wrote the book that details all of this. I have been studying and studying it. 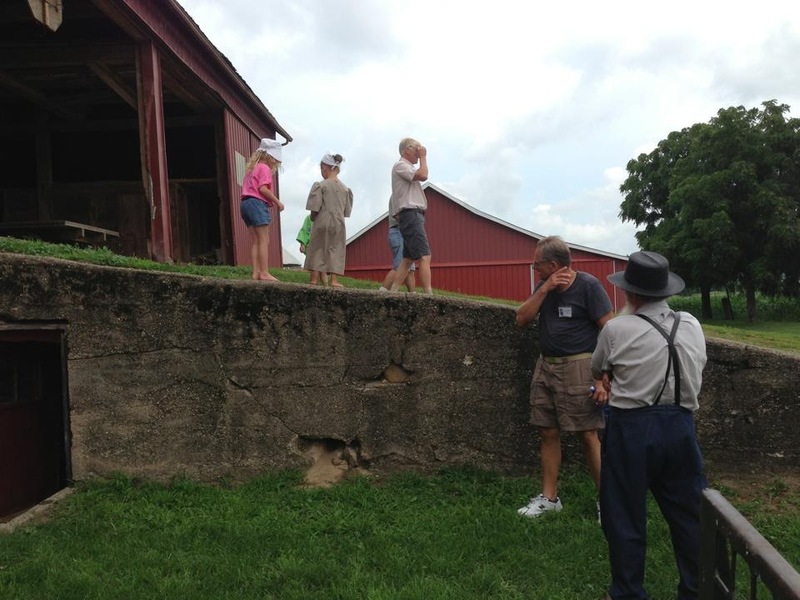 While we were in Shipshewana, we were able to tour my Great-Great-Great Grandfather Reuben’s farm, my Great-Great Grandfather Moses’ farm, and my Great-Grandfather Ervin Sr.’s farm. Of these, two remain in the family. 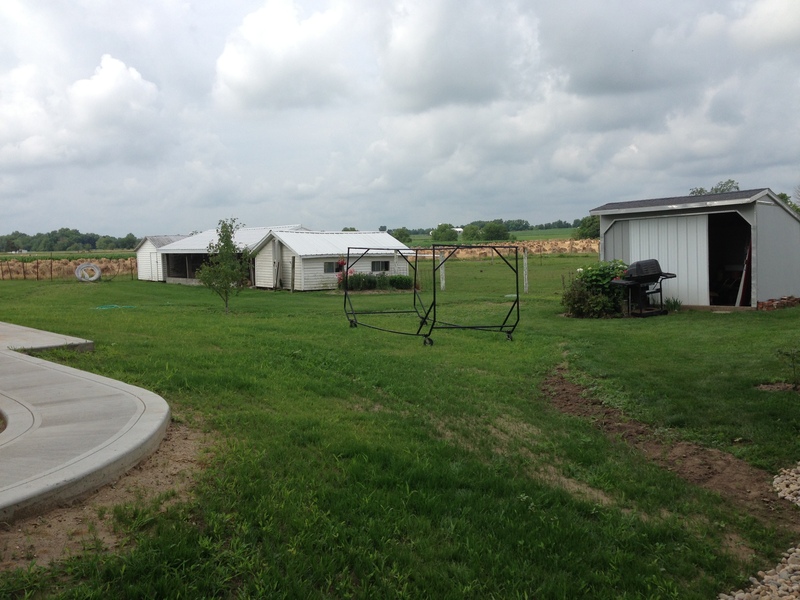 Reuben Yoder’s farm is now owned by an Amish family. The 8th, 7th, and 6th generation to set foot on Reuben Yoder’s farmland. We are wearing our reunion shirts in this picture, which has a photograph of the eight surviving children including Moses. Hilarious. I adore it. I love wearing my ancestor’s face. This whole family reunion business and historical lineage? Right up my alley! 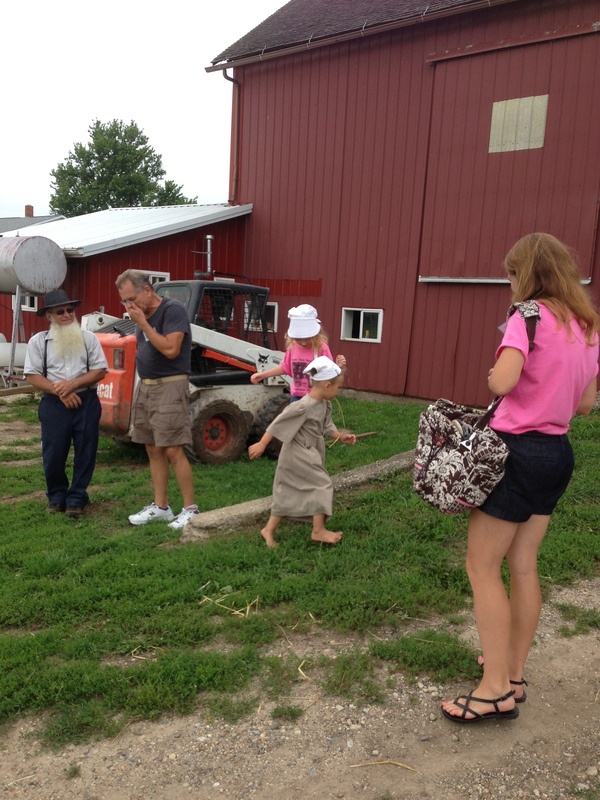 The Amish couple who owns the farm had two granddaughters. Since I know the Amish do not like to be photographed, I will only share back views and side profiles of this four-year-old girl named Kathy. I did not know until going through our photos that she happened to be in several. She was observing Katie and Eric at first. 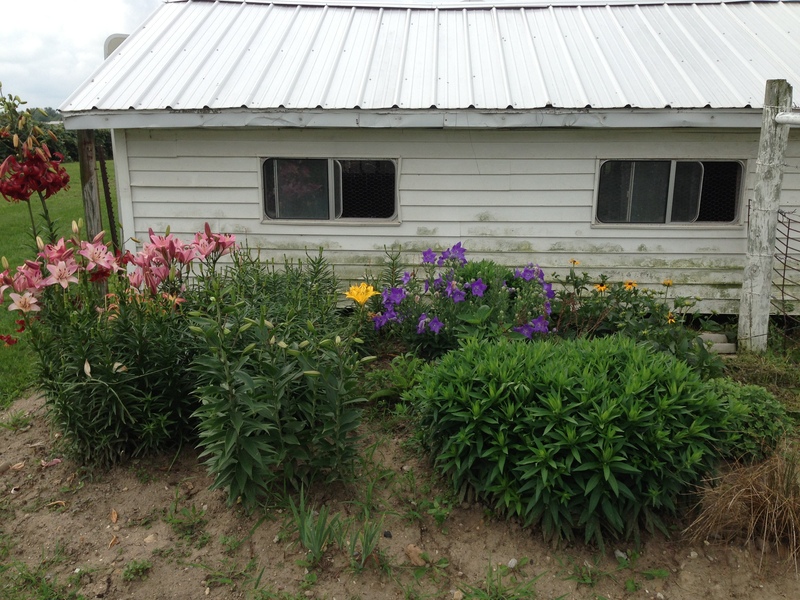 My mom and I were talking with Luella (Kathy’s grandmother) about her flower beds and garden. She was telling us about making mint tea and also about the portable drying rack her husband had made for her. I realized that I didn’t know where Katie had gone, and so I went over to the chicken coop where I had seen her earlier. Katie and Kathy were inside the coop with the chicks and fryers. Though Katie speaks only English and Kathy speaks only Pennsylvanian Dutch, they had found a way to communicate and were talking about raising chickens! We just got our chickens this year, and now here was a way to make a connection across language and culture on land that was part of my family starting eight generations ago! They discovered their names were both Katherine, and they each drew out the letter “K” to show how they spelled it. I saw them use fingers to show the ages of their siblings. Kathy took Katie up to the old barn. But first, Kathy, who was barefoot, pointed to Katie’s shoes as if to ask, “Why?” I helped Katie take them off and they went traipsing barefoot together. When they reappeared some time later, both girls were chewing straw. Katie told me that Kathy had shown her a little secret opening by which she could peek at the cows down below. Luella’s clothing rack, which her husband built last year. When it rains, she can roll it into the garage or shed. Very handy. In the back, the golden field is a collection of growing haystacks. Part of Luella’s garden, a lovely group of flowers. When we complimented her, Luella replied with humility, “I would hate to say that I am proud of it.” She prefers not to pick them but to enjoy them from her window. I told her that my black-eyed Susans (which she was also growing in the back there) were a gift as a cutting from my Aunt Debbie’s garden and were just getting blooms before I had left for Indiana. Sure enough, here I am back home and they are right on the cusp of opening. So many layers of connection. Katie has been talking so much about her new friend. I am thinking about Luella and her mint tea. In fact, Katie and I made our own mint tea this morning from the mint in our garden and thought about this new family we had met. We arrived back in Temecula early Tuesday morning (12:30 AM) and spent yesterday catching up on our chores (laundry, gardening, and chicken choring). We cleaned out our girls’ run, gave them some lettuce treats from the store, and supplied a whole bed of new sweet-smelling shavings. The girls got big while we were away, my goodness! I had to smile because I realize just how many of our hobbies and values as a family (gardening, quilting, sewing, raising chickens, homeschooling, not drinking alcohol, being more pacifist-minded, tending more toward being on the quiet side, my love-hate feelings for technology and its ills, etc. etc.) truly fit in with the Amish and Mennonite culture. It’s almost funny. Whereas in California I have always felt like I do not fit in entirely (and that’s totally okay with me—I lose no sleep over that! ), there I was very much like many other people. There are many ways I am different, too, but the traits-in-common seem to stand out. I felt so at home with them. Katie harvested this jalapeno from our garden yesterday. (We don’t usually keep the garden boxes on the lawn, by the way, but I had put them there to make sure they got enough water in the heat). We’ll probably make some more jalapeño-cilantro-lime hummus with it either today or tomorrow. We also made and jarred two kinds of applesauce yesterday afternoon, using some of our early-season apples from our tree and others from the market. Today we’re baking double challah loaves so we can give one to my mom when she gets home from Nana’s. Katie and I spent some of the day yesterday working on our cross stitch projects (she is working just on technique right now). Even before I left, my friend Jeremy was teasing me when he found out I come from the Amish. “OHHHH! That makes so much sense now!” he joked. But it does!